QC magnetic overhead crane is a sort of double girder crane specifically designed to handle metal sheets, scraps and other metallic materials since it is able to generate powerful magnetic forces by utilizing a detachable electromagnetic chuck. 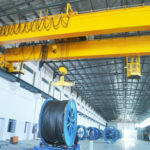 The electromagnetic overhead crane is designed for heavy duty service (A6) that can lift loads with large capacity, typically in a range of 5 ton to 50 ton. 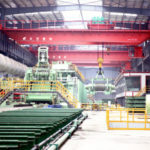 The electromagnetic crane is extensively applied in metal scrap recycling departments and steel making workshops to lift and move dozens of tons of iron scrap, steel scrap, iron block and other metal products. Without the need of strapping, these magnetic black metal products can be easily handled by powerful electromagnetic overhead crane, which will not only save labor, but simplify the work. 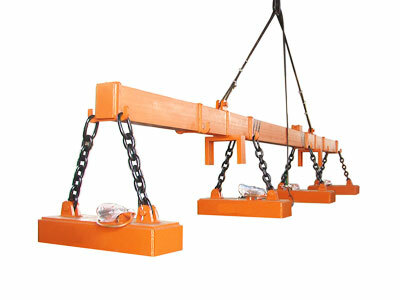 In addition, the metal products packed in wooden box can also be handled by this particular crane in the same way. Simple structure and delicate appearance. Excellent safety and reduced downtime. Large lifting capacity and high work duty. Low power consumption and noise during operation. Top quality and factory price. 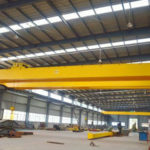 The magnetic overhead crane has the same structure with typical double girder bridge crane, mainly composed of bridge girder, end trucks, hoist trolley, crane travelling mechanism, electrical system and cabin. Only one slight difference is that it utilizes electromagnetic chuck hanging from the hook as lifting media. The electromagnetic chuck system consists of electromagnetic chuck, cable reel, rectification control system and cable connectors. 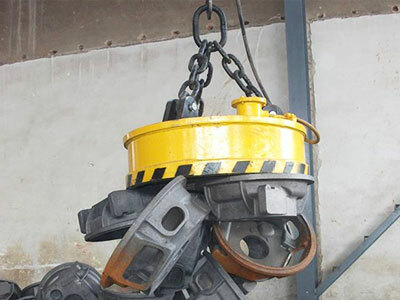 When the crane is equipped with main and auxiliary hooks, the lifting media correspondingly have main and auxiliary hook electromagnetic chucks. Mounting to the same trolley frame, the main and auxiliary hosting mechanisms have separate drive device, which can perform lifting work independently. 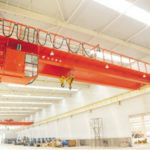 Typically, the operation of electromagnetic overhead crane can be classified into ground control and cabin control. Crane users can choose any one of them depending on load capacity, ease of use and safety considerations. The ground control is more suitable for small capacity lifting applications, such as lifting 3 tons or 5 tons weight. To realize a much safer lifting operation, wireless remote control is commonly used in varied light duty lifting occasions. 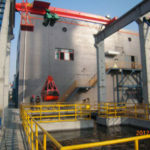 Cabin control is more often used with heavy duty crane that lifts a substantial amount of weight. The cabin provides wide vision and comfortable operation. It can be fixed either on left or right of the equipment. The open modes of cabin room mainly include end open, side open and top open. 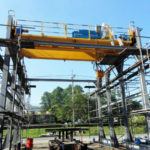 Here are some overhead magnetic crane projects from our clients for your reference. 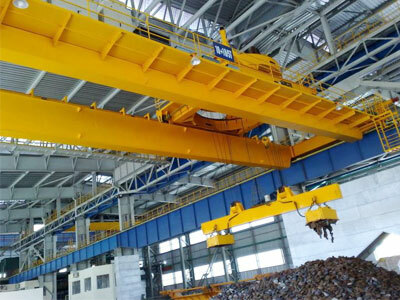 Double girder magnetic overhead crane ordered by Automobile Steel Plate Co., Ltd is used to lift and move steel plate and scrap. The control system includes cabin control and remote control. 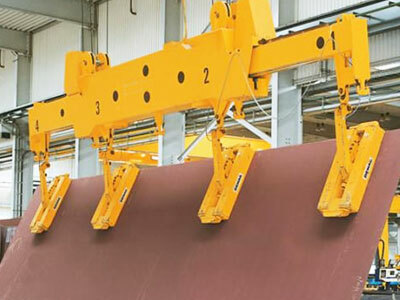 Hebei Jingye Iron And Steel Co., Ltd ordered an overhead magnetic crane to handle metal products. The model and capacity are QCL25+25ton. 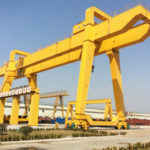 Electromagnetic cranes provided by Dafang company can be non-standard customized according to special requirements of clients. If the given technical parameters of magnetic overhead crane in the form below cannot meet your demands, please feel free to contact our sales manager online and ask any question you have. Our experienced technical team will assist you to design the best solution for your individual needs. 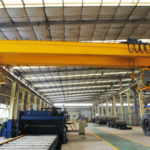 To know more about magnetic overhead crane, contact us today!